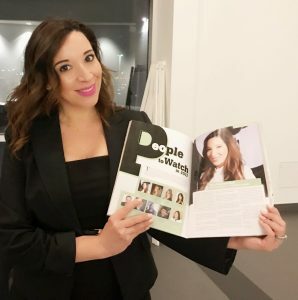 Tyra Bell-Holland, Founder of Ava Rose Agency and ResortCierge|MD, was named People to Watch in 2017 by Las Vegas Woman Magazine joins UNLV’s Alumni Engagement Committee as a Chairperson and welcomes new role as a Board Member of the American Cancer Society. LAS VEGAS, NV. (April 4, 2017) – – Tyra Bell-Holland, Founder, and CEO of Ava Rose Agency and ResortCierge|MD is living up to her notable mention by Las Vegas Woman Magazine as People to Watch in 2017. As Tyra continues to demonstrate determination and fortitude she has recently accepted positions with UNLV Hotel College Alumni Association and The American Cancer Society | Great West Division. As Chairperson of UNLV Hotel College Alumni Engagement Committee, Tyra’s responsibilities will include recruiting and organizing a team of volunteers that will be accountable for planning, participating in, and measuring all assigned events by the Hotel College Alumni Association. The team will also have to strategize and execute initiatives to focus on connecting alumni to the school and to build professional relationships. Tyra is no stranger to building relationships. After she became a member of Les Clef’s d’Or USA in 2002, she later became President of Southern Nevada Hotel Concierge Association (SNHCA) where she successfully delivered world class service and recognition to hospitality in Las Vegas. “I look forward to representing my Alma Mater and giving back to the Hotel College in the best way I know how – in service through friendship,” says Tyra Bell-Holland. Reaching significant achievements and milestones, Tyra received DLXVRSN’s most prestigious award, “2017 Woman of The Year.” In 2016, she was recognized in My Vegas Magazine’s “Top 100 Women in Las Vegas” and “Top 10 Most Intriguing Women” by Las Vegas Weekly. Tyra Bell-Holland holds a Bachelor of Science in Hotel Administration from UNLV, and she is a Certified Hospitality Educator from the American Hotel & Educational Lodging Institute. Creator | Founder of the first Concierge curriculum in the State of Nevada, also a former instructor at The International School of Hospitality (TISOH), Honorary Member of The Southern Nevada Hotel Concierge Association and a member of the National Concierge Association. Ava Rose Agency specializes as a single platform for world-class Public Relations, Partnership Marketing, Brand Strategy, Special Events, Social Media, Sales, Etiquette and Consulting, Talent Acquisition. Ava Rose Agency presents a confident, polished approach at marketing products and services by getting the word out to well-respected, recognizable industry leader so that the message is immediately impactful and welcomed then shared amongst their entire network of influencers. RESORTcierge MD is the first dedicated 24/7/365 House Call Medical Group servicing the Las Vegas luxury resorts. Expertly and compassionately combining hospitality and medicine by recognizing what was lacking in the conventional form by not referring quality care in a meaningful manner. Instead, RCMD chooses to embrace the full potential of medical tourism by being providing leading doctors dedicated to each guest, one guest at a time.